I have been here just over a month now and I thought it would be a great opportunity to update you a bit on what has been going on. Firstly, I think I am getting to understand how everyone takes their tea, a very important thing to get right in this office as I am sure you all understand how important a good cup of tea is! My time has been split between being in the office preparing for shows and the Crosthwaite and Hoathwaite activity days, inputting data and out and about getting to grip with the rivers and becks in South Cumbria. When I signed up for this voluntary position I never thought I would be making pipe cleaner dragonflies, I never have been a very crafty type of person but if I can make a dragonfly out of pipe cleaners and beads then anyone can! I have also been creating butterfly and moth ID sheets to be used as part of a new buffer strip monitoring programme. This monitoring programme will be undertaken shortly after fencing has been completed alongside becks and rivers and will be continued for a few years to give a record of the success for nature riparian fencing has. Beck side fencing is extremely important; it prevents poaching from animals alongside becks which in turn prevents excess soil and sediment from being washed into the river. It provides a buffer strip from runoff from fields and provides a superb riparian habitat for dragonflies, butterflies and moths which this survey will be focussing on. Apparently, walkover surveys should be undertaken in the rain, if only we remembered the waterproof paper! Outside of the office I have undertaken walkover surveys in the Duddon valley, (Rachael wrote about in her blog), taken to Elterwater to be shown by Mike Sshown how some monitoring work is carried out and most recently been out with Mike W to repair a solar water drinking trough that is installed after becks and rivers have been fenced off to create a new drinking point. Myself and Kath had the pleasure of attending one of the Lake District National Park guided walks around Tarn Hows and Coniston. A particular highlight of mine was the Hoathwaite activity day which I think it’s safe to say was a success. Myself Mike W, Kath and along with some of the trusts all important volunteers spent the day with the National Trust on the shores of Coniston, we had a great time and I’m sure the visitors did too. 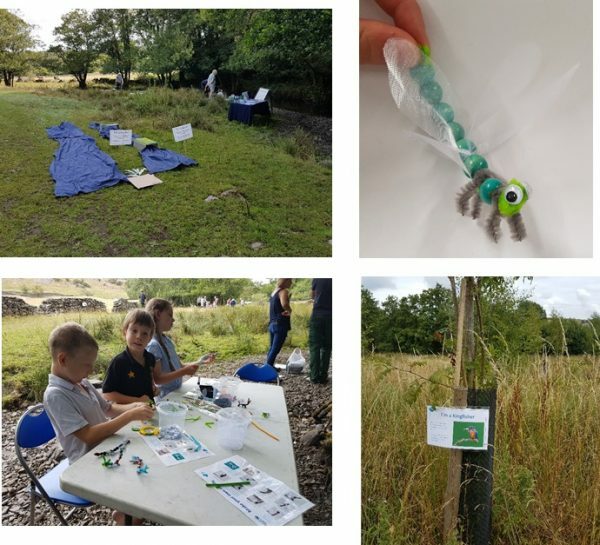 Dragonflies and Damselflies were made out of pipe cleaners and beads, rocks were painted, becks were dipped, fish were flapped and many badges were made. Luckily the rain held off for the majority of the day even if it did start raining just as we started to pack up. I’ll catch up with you all again before I return to university in September. A few pictures from the Crosthwaite and Hoathwaite activity days.